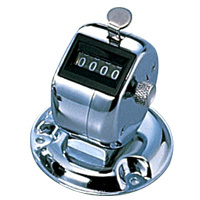 Convenient hand-held counter incorporates hardend steel mechanism for long-term operation passed endurance test for 10,000,000 counts. Finger ring for easy operation. Over 50 high-tolerance precision steel parts. Quality steel with chrome finish. Simple zero reset. Light weight: 95g. 4 digits. 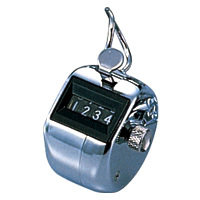 Desk tally counter. Mounting plate for temporary or permanent attachment. 4 digits. 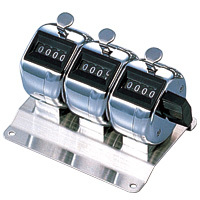 Multi-unit tally counter 3-unit model, each with up to 4 digits. Ideal for a wide range counting applications: traffic surveys, meeting attendance, security analysis, etc. 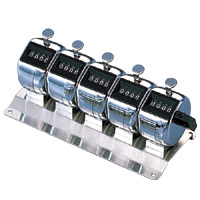 Multi-unit tally counter 5-unit model, each with up to 4 digits. 2-10 unit custom-made model available. 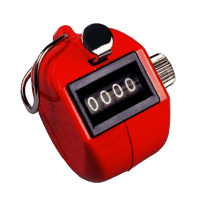 Light weight, colorful hand-operated tally counter. Available in 3 colors-Blue, White or Red. Great for grouping and summing counting subjects.